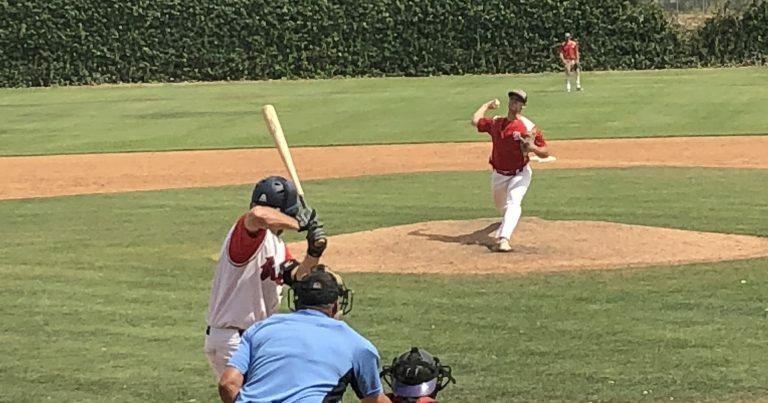 PALM SPRINGS, Calif. ~ The Palm Springs POWER had a rare off day on Sunday, but followed it up with two big wins on Monday against the Inland Valley Bucs, winning game one 8-2 and game two 8-1, clinching the first seed in the 2018 SCCBL Playoffs. Jonathan Buckley (St. Mary’s) gave up just five hits while striking out four in a complete game victory. Ben Nisle (Purdue) hit his first homer of the season as well in the 8-2 victory in game one. The POWER were victorious in game two as well, winning 8-1 thanks to a strong day at the plate for Shunto Kamoshida (Keio University) who went 3-for-4 with a home run and a double. Jack Metcalf (Erskine University) pitched five innings to earn the win, while Cameron Sepede (UNLV), Caleb Mitchell (Mercer), Naithen Dewsnap (Cal State Bakersfield) and Darin May (Cal Poly Pomona) each tossed a scoreless inning in relief. The POWER are back in action tonight at 7:05 PM, it’s two dollar Tuesday at Palm Springs Stadium, all hot dogs, sodas and Bud/Bud Light Pints are just two dollars! Gates open at 6 PM.